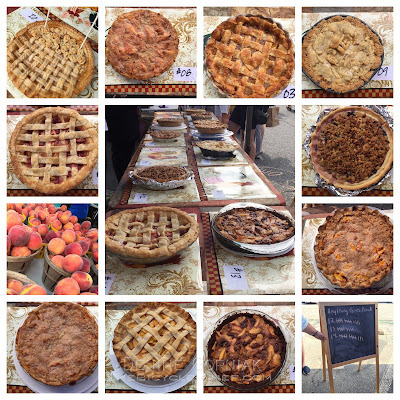 A look at all the pies, fresh peaches in season and our tally board! 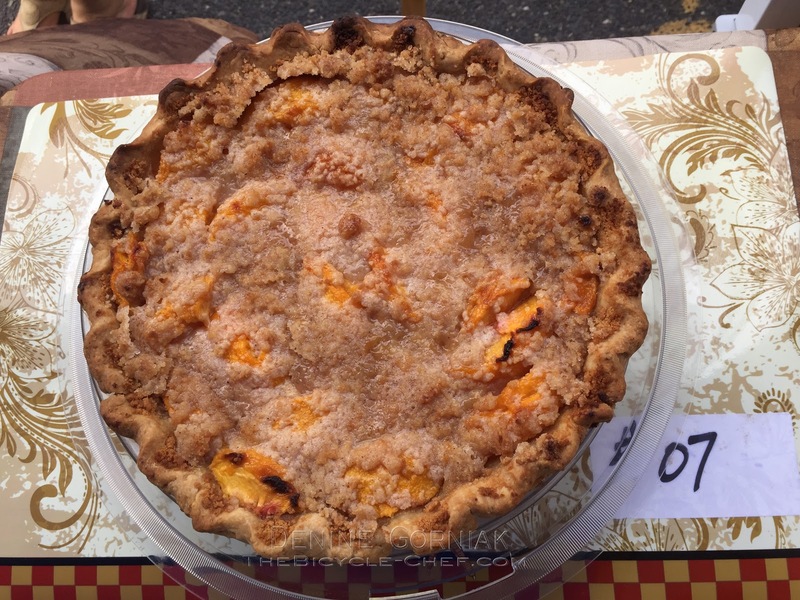 The 15th annual Peach Pie contest was held on Saturday, August 5, 2017, at the Collingswood Farmers' Market. I was invited to be a judge/blogger/commenter and once again I took my duties very seriously! After last years' two pie contests, I was prepared for some serious sugar high crashing so I ate a protein smart breakfast and drank plenty of water. Part of my strategy was to take only small bites, to make careful notes, and to smell and observe the pies so I didn't over-indulge. I planned well. Winners, Contestants, Judges, Pies and the Tally! You would be surprised at how difficult a job it is to be a food taster for a contest. I have a new found respect for the folks who do this. It's not as glamorous as one would think but it can be fun. This year's peach pie contest was good time. We had 10 entries this year, down 1 from last year. We were planning on 20 entries. My taste buds were relieved. 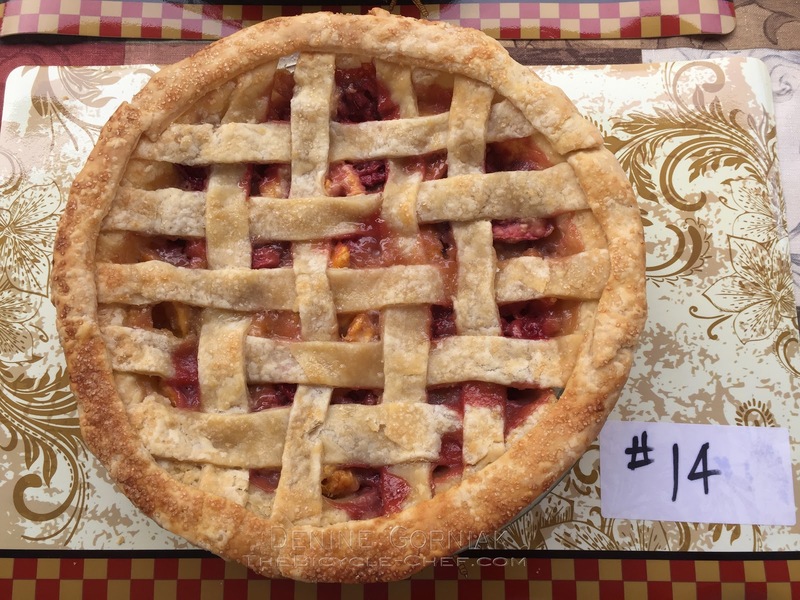 With only 10 pies to judge, we had a clear case of almost everyone was a winner. This was especially true for the "Anything Goes" Peach Pies category - mixed fruit or peaches plus; there were only three pies to taste. It became a matter of placement for those three pies. Anything Goes Mixed Peach Pies and 2 Winners! With 10 pies to taste, it was easy to judge for the three categories: Presentation, where all 10 pies were judged on looks; Classic Peach, in which we had 7 pies to taste; and three to each in the Anything Goes, peaches w/other fruits, custards, bread pudding style, you name it. Below I've shared photos of each pie, with details about it, as well which pie was a winner (and they all were winners in one way or another!) Each pie's number corresponds only to the placemat order, not their winning order. Read on to see my remarks. As as side note, and maybe this was the "sugar high" part of the day, I neglected to get the full list of actual participants and which pie they brought to the table. I'm sure I'll update this post after it's gone live, with the names of the fantastic bakers. Advance apologies for my forgetting this crucial detail! Pie #1 by Natasha Zirbel - 2nd Place in Presentation and 2nd Place in Classic Peach (taste). This beautiful pie with several crust and topping embellishments was not only pretty to look at, it tasted great too. Her lattice, rosette and banner topped Classic Peach Pie won two prizes and it was no mystery as to why. The crust was perfect and there was a good balance of sweet and tart to the peaches. Notice Natasha's handiwork on her top crust - lattice with braiding; rosettes topped by a braided upper crust. She topped her pie off with a small banner that said, "Life's a Peach". A lot of work, talent and love went into this pie. "If looks could kill she's got a winner. The taste is there to back it up." 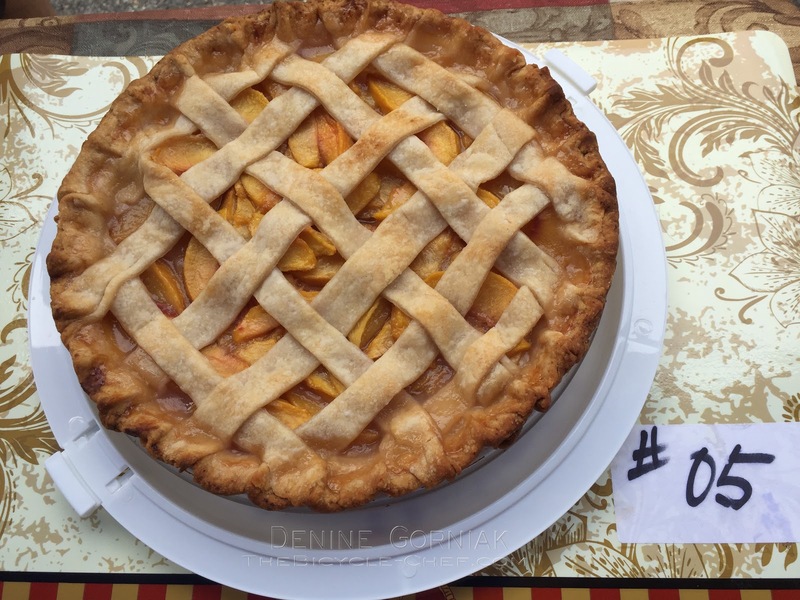 Pie #3 by Kirstin Hanna Campbell - 1st Place in Presentation and First Place in Classic Peach (taste). 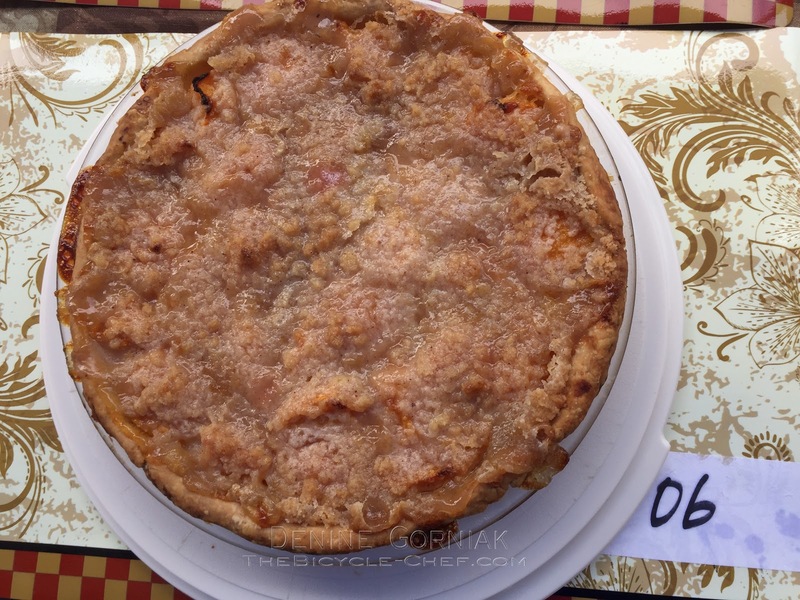 Baked with heart, Kristin's peach pie was a deep dish classic with a flaky crust. Her peaches were perfectly sweetened with a hint of butter. This rustic beauty captured all the judges taste buds. 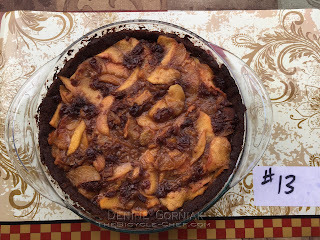 It had a pop of salt in the crust and a warm and buttery peach filling. Kristin and her daughter, Maddie, are friends and school mates of my son, so I had to be sure to not see which pie was hers when they were placed onto the judging table, in case I had any biases towards her! I did such a good job at not noticing which pie was hers that I was shocked when she was announced as the winner! Kristin is a pie baker of many years, winning accolades and prizes in other years. I can see why her reputation as a star baker shines so brightly among our friends and neighbors. Pie #5 This clean, bright, fresh peach pie was one of my favorites. The lattice top was nice with a flaky tender crust. There was an excellent peach to crust ratio. I loved that it wasn't too sweet and had a bright fresh peach flavor. Pie #6 Had a Brown Sugar Streusel Topping. It was sweet but had a nice balance for such a sugary topping. The bottom crust gave this pie some needed structure. Pie #7 Another Browned Sugar Streusel Topping here. This pie was filled with juicy peaches that were peeking through the topping. The peaches were fresh and popping with flavor. This was one of my stand-out favorites in the taste category. My notes on judging day were, "Looks lovely... Dive on in, the peaches are fine!" Pie #8 by Cheryl Pope - 3rd Place in Classic Peach (taste) This deep dish pie was filled with nutmeg and cinnamon specks but the seasonings did not over-whelm the peaches. The sweet streusel topping was a nice counter-balance to the buttery bottom crust. Most of the judges went for this sweet beauty. Cheryl was another returning baker. I remember her running to the table last year moments before the contest started. She arrived early this year, with time to take home a prize for one of the top pies in her category! Pie # 9 - baked by Greg Dollak. The "PIE" Peach Pie. 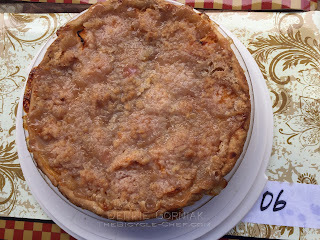 I appreciated the top crust being embellished with cut out letters spelling out P I E. Greg and his son and daughter are returning contestants - having been in this season's salsa contest and last year's pie and chili contests held at the Farmers' Market and the Fall Festival. I love it when families enter or return to the events, for it's what makes our town of Collingswood so special - the involvement of our families and community. This was a homespun pie baked with love and a lovely flaky crust. Pie #12 by Rikki Hein, 1st Place in the Anything Goes. 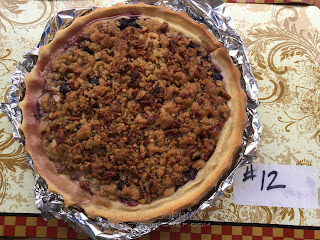 I found out after the contest that Rikki (who is a friend, but I didn't know she entered the contest) baked a vegan pie using Earth's Balance "Butter" This peach and blueberry streusel and pecan topped pie was a judge favorite. I always feel that blueberries and peaches are natural partners. Rikki certainly made this true in her pie. Clean tasting, not too sweet with a nice bottom crust and a firm outer crust edge. Pie #13 - 3rd Place in Anything Goes. A Peach, Nut, Raisin and Bourbon Pie. This was one of the only pies to be baked with a non-traditional crust. The baker opted for a nut crust which gave this pie a smokey taste. The pie was not topped with crust or streusel, allowing the peaches and raisins to shine through and be the star of the pie. This pie was one of the more clever takes I've tasted in an Anything Goes category. Pie #14 by Stefanie Sutton, 2nd Place in Anything Goes. At first I thought this was another peach and blueberry or peach and nectarine. Was I ever surprised when I tasted it and learned that it was peaches and strawberries. Lovely subtle aroma of strawberries and vanilla that complimented the peaches. I would have never thought of paring peaches with strawberries but I shall thanks to Stefanie's inspiration! I loved the tender lattice and bottom crust and thought the sugar sprinkle on the outer edge was just the right touch. After talking to Stefanie at the end of the contest, I also learned that she has only baked a few pies before the contest. Stefanie told me she's more of a baker of cakes and that pies aren't one of her specialties. Could have fooled me! She's a natural born pie maker! Congratulations to all of our entrants. You all should be proud of your accomplishments. Each of you is a winner to me. I thank you for the delicious pies, the ideas you gave me and for the chance to photograph and write about your baked delights. Can't wait to see what you may do come apple time in the Fall!